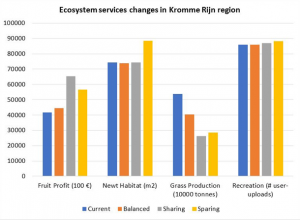 Scenarios of changing Land use management allowed to calculate Ecosystem Services and Biodiversity indicators for the Kromme Rijn area. After developing and elaborating scenarios for the Kromme Rijn region in WP3, spatial distribution and changes of four ecosystem services were modelled for the present situation, as well as in a “balanced” scenario that represents a business as usual, and in a land sparing and a land sharing scenario. Results show that overall, fruit profit tends to increase and grass production is expected to decrease, while recreation is assumed fairly stable. 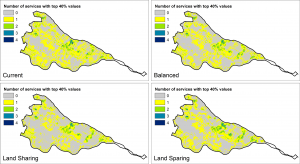 When looking at the joint production of multiple services, the results suggest that both the land sharing and the land sparing scenarios can lead to more areas where multiple services are supplied simultaneously (maps). Indicators were calculated based on the ESBD models.